Public tours begin this month for the Rome Italy Temple of The Church of Jesus Christ of Latter-day Saints in Italy, the Church’s 162nd operating temple in the world. 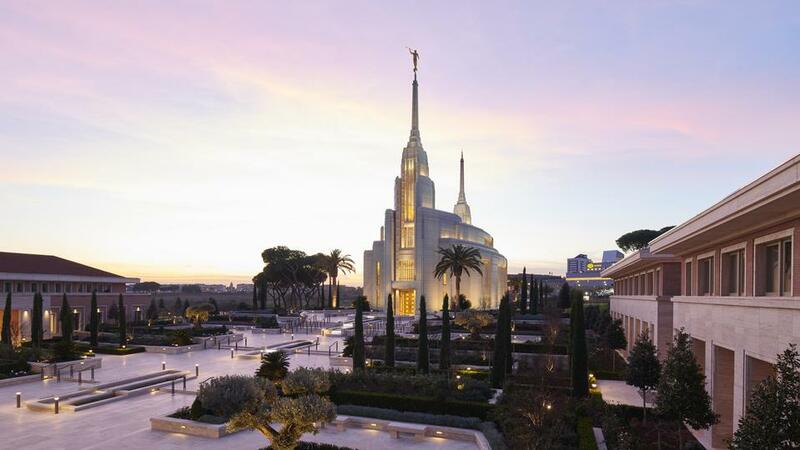 After years of construction, Italy’s first Latter-day Saint temple will be open for a free public open house from Monday, January 28, 2019, to Saturday, February 16, 2019, excluding Sundays. The Rome Italy Temple is in northeast Rome near the village of La Cinquina Bufalotta. The temple’s architecture was inspired by ancient Rome. Its exterior is constructed from Bianco Sardo granite. The Rome Italy Temple is part of a 15-acre religious and cultural center that includes a multifunctional meetinghouse, a visitors’ center, a family history center and housing for visitors. At the temple’s entrance, a floor-to-ceiling stained-glass wall depicts a scene from the life of the Savior Jesus Christ. Stained-glass windows are inspired by the olive tree. Warm earth tones and blue, bronze and gold hues can be seen throughout the interior. Top artisans and craftsmen have installed the high-quality materials, which includes Perlato Svevo stone flooring quarried in northern Tuscany; Cenia marble from Spain; deep reddish brown Sapele, burl and cherry wood millwork; and Murano glass fixtures from Venice. “We hold our craftsmen to the highest possible standards,” explained Bret Woods, project supervisor. Woods said the temple’s grand lobby staircase is an engineering feat. “It’s connected just at the top and the bottom, so it’s essentially a free-floating staircase — and of course, an elliptical shape.” The oval design of the staircase is reminiscent of Michelangelo’s Piazza del Campidoglio masterpiece near Capitoline Hill in Rome. Original paintings hang in all areas of the temple, reminding temple guests of Jesus Christ and His teachings to follow Him. A picture in the baptistry depicts the Savior’s baptism by John the Baptist. The baptistry’s purpose is in keeping with the Savior’s example to enter the waters of baptism and His commandment that all must be baptized. In the temple, patrons can act on behalf of those who did not have the chance to be baptized in this life. The oval motif continues in the baptistry, where inlaid stone wraps around an elliptical font adorned with Roman-style acanthus leaves. The font is held up by 12 oxen representing the 12 tribes of Israel. In the instruction room where Church members learn about God’s love, the creation and the purpose of life, a mural reveals a magnificent setting depicting Italy’s landscape ranging from the hills to the sea. The Baroque-era feel of the bridal room is enhanced by the crystalline sconces and hand-painted chairs. A seemingly endless reflection from the mirrors in the sealing rooms symbolizes eternity. In those rooms, Latter-day Saint faithful participate in sacred ceremonies that join families together forever. An exquisite chandelier containing thousands of crystal prisms serves as the centerpiece of the celestial room, a space that represents the progression of reaching heaven. The room is also filled with elegant furnishings made by Italian artisans. In the visitors’ center, a life-size statue of the Christus accompanied by the original Twelve Apostles faces the temple through full-length windows. The statues are replicas of sculptor Bertel Thorvaldsen’s works displayed in the Church of Our Lady in Denmark, except the Judas Iscariot figure has been replaced by a statue of the Apostle Paul. Special permission was received from the Lutheran Church to digitally scan the original figures. Carrara marble for the three-quarter scale statues was taken from the same quarry in Tuscany as the marble for Michelangelo’s David. “When I saw the statues of the Savior, the Christus, and the Twelve Apostles, it was just a spiritually stunning moment for me,” said Elder Bednar. The statues are complimented by an original mural of olive trees in an Italian countryside that serves as a backdrop. An interactive exhibit is located in the Rome Italy Temple Visitors’ Center. The visitors’ center, temple patron housing and a meetinghouse connect to the temple through an Italian-style piazza or square constructed from native travertine. “These artisan stone layers have been working for seven generations,” said Alberto Malara, senior assistant of Temple Facilities Management, who said the master stone layers spend 400 hours in the classroom. The Church also salvaged 110-year-old Basalt cobblestones from the streets of Rome for the temple roundabout. “If you look closely at some of these stones, you can see the grooves worn in by the passage of old wagon wheels,” described Malara. Church leaders will meet with the media and take them on tours of the Rome Italy Temple on Monday, January 14, 2019. VIP tours for leaders of government, business, legal, interfaith and humanitarian organizations will be held at the temple from Tuesday, January 15, through Tuesday, January 22, before the public open house begins on Monday, January 28. Reservations for the public temple open house can be made online at templeopenhouse.lds.org. 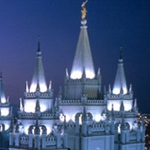 The temple will be formally dedicated Sunday, March 10, 2019, through Tuesday, March 12. Members will be able to perform ordinances in the new temple beginning Tuesday, March 19. Construction began on the three-story, 40,000-square-foot temple on October 23, 2010, two years after the Rome Italy Temple was announced by Church President Thomas S. Monson. He and local Church and community leaders participated in the groundbreaking ceremony. Latter-day Saints and other Christians consider Rome to be one of the most historic locations in the world, a biblical city where the ancient apostles Peter and Paul preached the gospel of Jesus Christ. In 1997, the Church purchased the temple site, an abandoned 15-acre farm, which included a villa, small olive orchard and outside pizza oven. Olive trees from the old farm were preserved, and ancient olive trees from northern Italy, ranging in age from 400 to 500 years old, are planted in the piazza. The Church also preserved Italian stone pine trees on the property that line the stairs leading to the temple. The temple will serve over 23,000 Church members living in Italy and in neighboring countries. Currently there are more than 160 operating temples worldwide, including 12 in Europe.